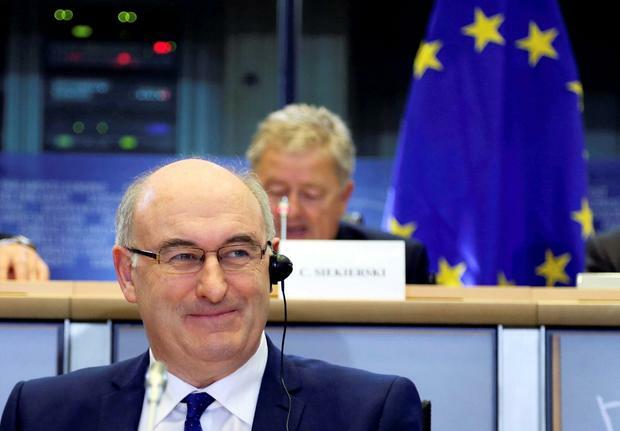 Talk of a special EU support package for Ireland to help cope with the huge fallout from Brexit is “totally premature”, Ireland’s EU Commissioner Phil Hogan has said. Mr Hogan will today attend the first meeting of EU agriculture ministers since the Brexit referendum result early last Friday morning. Brexit is not on the formal agenda for today’s talks in Luxembourg – but it is expected to figure in discussions given the huge implications for farm funding. Agriculture Minister Michael Creed last week said Ireland expected to net €1.2bn in EU farmer grants next year. Britain contributes a net €8.4bn to the EU coffers each year, and a large chunk of this goes to the Common Agriculture Policy (Cap), which still accounts for 37pc of the EU’s entire budget. Ireland got special EU aid in 1979, when the government broke the link with sterling and joined the Exchange Rate Mechanism. In the early 1990s an extensive aid package, worth €1.2bn per year in regional and social grants, was paid over a decade to help Ireland cope with the shock of entering the EU border-free single market and the emerging single currency. But in his first public comments since Brexit, Mr Hogan said a special aid package for Ireland – or any other member country – just does not arise at present. “We must await the detailed negotiations of Britain’s exit terms and the new relationship to be worked out between the EU and the UK for the future. Only then, when all of that is completed, could we look at other issues such as support packages for other member states,” Mr Hogan told the Irish Independent. EU agriculture funding has been a consistent source of controversy for Britain on many occasions since it first joined the EU, alongside Ireland and Denmark, in January 1973.
extensive food shortages, and even famine, in the immediate wake of World War II. Some of the British agriculture disputes turned on London’s efforts to keep buying food from former colonies like New Zealand, Australia and Canada, as well as other markets in South America. The two fears for Ireland, and other farm economies like France and Germany, is that Britain’s departure will hit the overall fund and also lead to Britain again sourcing more food outside the EU. Mr Creed will be in Luxembourg today for the crucial farm talks. A spokesman for the minister last night said he would not be commenting in advance of the meeting, pointing to the contingency plan published on Friday, which pledged to defend Ireland’s trade interests in the wake of Brexit.